A week that started off with an 80 degree high temp ended in the 30’s and I have finally accepted that it is again Fall. Walking through the crunching leaves scattered over the sidewalks I feel time ticking down to the winter. This means it’s time for indoor entertainment, cooking and change. We were invited by some friends to meet up at a local bowling alley (Rapids Bowling Center) for Karaoke Night last weekend. I stepped out of the car and walked into a bizarre independent film scene. 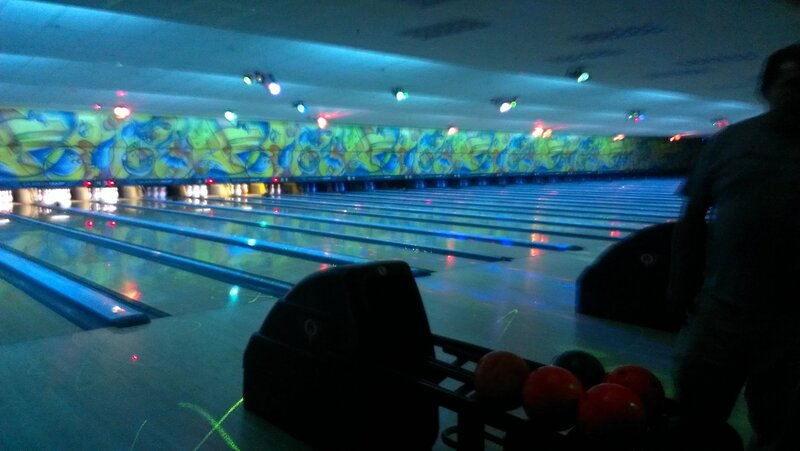 The bowling alley was flooded with a mellow blue glow from the night time games on the lanes. The welcoming and roomy lounge was filled with people from every walk of life laughing and singing and dancing. The bar went wild for Rob Z of Z-Licious Karaoke who lead Karaoke with so much glee- dancing and singing that his happy spirit was contagious! Soon we were cheering on everybody who came up to sing- and there were some amazing singers. The most unlikely choices of song for each person. A man who came in looking like a clergyman calmly strode to the mic- and the burst out “BABY GOT BACK”! A tough guy with tattoos and a backwards baseball hat sang Love Ballads from the 70’s. Rapids is like an outpost of strangers in a strange land. Even the most misfit shy and awkward person can make friends and bond with the group of former high school glory girls who are all there to just have a good time. People at the edge of 22 are high fiving 70 year old ladies. No judgements. Saturday night Karaoke at the Rapids turns out to be a hell of a good time! If you’re into bar food this is also the place to be. We snacked on a huge platter of french fries smothered in golden cheddar cheese, bacon and ranch dressing. Now I have a plan for some indoor winter fun. My other cold weather coping mechanism is cooking. And this nearly 50 degree drop in temperature week brought out a taste for some soup. What’s better to warm up a chilly old house than a simmering pot on the stove? I found a very simple quick soup that was done in less than an hour start to finish! Not a gourmet-artisanal-hand-crafted-everything-from-scratch kind of thing but a good old modern America comfort soup. It popped up on social media last week and I thought steamy soup in my kitchen was just the thing to chase away the Fall chill. It’s called “Lasagna Soup” and though it contains not all the ingredients of a great lasagna, it does deliver on it’s promise of tomato-ey goodness with savory Italian spices and belly warming ground beef and noodles. You can find the recipe HERE at Taste of Home. We people of Western New York state are great at adapting to changes. It’s in our blood to transform from shorts at the beginning of the week to jeans and sweaters by the end of the week. Viva La Niagara!